I don’t believe in not seeing the negative. But you can take that negative and make it a positive. Change the form and you can change your life. The next time you’re waiting for the train at the Rockwell stop, check out the outdoor mural painted there. Why did they paint it? How does this mural reflect our community? I don’t know the “real” answers to these questions—that’s MY homework for this year! Another idea is for you to choose one of the women featured in the mural and create an imaginary story of her life. I’ve done this many times—Boy, the train arrives before you know it when you are doing this activity! We are concerned about e-Waste awareness in our school. I need your creativity, ideas and help! Think of interesting ways to express the importance of recycling e-Waste (old, biohazardous, out-of-date technology) that is both beautiful and meaningful. Email me your ideas or bring in your designs to room 112B before school. I can’t wait for your feedback. Try to draw a picture in three parts by folding your paper in thirds. Create a beginning on the first folded third, a middle on the second and the ending on the last third of your paper. Does your drawing tell a story? I bet it does! 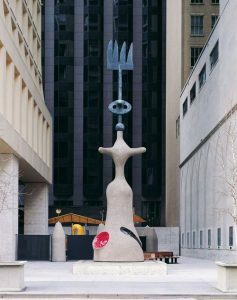 Take a field trip or conduct a scavenger hunt downtown to explore Chicago’s amazing array of public art! This could be a great photography project…your child could take photos from a variety of angles with some incredible results. Please bring your photos to room 112B for sharing! Your child can be “Teacher For The Day.” If you need to borrow a digital camera, let me know and you can check one out from the art room for the weekend. Check out all of the art room resources in Mrs. Vecchioni's Google Classroom. You will find videos, handouts and other fun information featured on the ABOUT page. Nek Chand is an outsider artist that truly uses his art to transform his community. Thirty-six years ago he began recycling discarded car parts, light bulbs, broken pottery and a variety of other found objects. He did this after working all day as a transport official in Chandigarh, India. His recycling project began as a small outdoor garden on public lands. He needed to work in secret because the jungle area he was making his sculptures was declared "open space" by public officials. He worked after work and on weekends and soon had an outdoor garden that had hundreds of sculptures and spanned many acres! When his sculpture garden was discovered, it was declared a national landmark. Today, the nearby city sends Mr. Chand its recyclables and he has a salary, a staff and as much space as he needs to continue to create his sculptures. The Rock Garden of Chandigarh now has twenty-five acres of land and several thousand sculptures! It is considered one of the modern wonders of the world and is second only to the Taj Mahal for visitors in India each year. We referenced Mr. Chand's vision and sculptures as inspiration for our E-waste Global Citizenship Sculptures. We will be looking at The Rock Garden of Chandigarh in our outsider art fellowship with The Intuit Gallery this year.